We've stepped through the door into a strange new realm called the Kuiper Belt. Out there and beyond is a deep freeze of not just new worlds, but also simmering issues — including perhaps even our very origins. To clarify things, Herbert Wright imagines a large dining table to map it all out on. Orbits of Pluto and PT1, New Horizons' flyby targets. Dr Alex Parker's animation shows New Horizons' journey (yellow), starting from Earth (near centre) and crossing planetary orbits (blue), the outermost being Neptune's. It is now encountering Pluto (white) and in 2019, PT1 (orange). The Kuiper Belt is indicated by the scatter of orange and white dots, each a major 'KBO'. LONDON — Plutinos, Cubewanos, Sednoids . . . these words didn't exist when Pluto was discovered in 1930. Back then, the planets we knew in the whole universe numbered just nine, and Pluto was the furthest away. Now, in July 2015, as NASA's space probe New Horizons encounters it, we have seen every one of those nine planets close-up, from space. Ahead of New Horizons lays the abyss across which the impossibly distant stars shine. We have reached the edge of emptiness. Or have we? The picture has changed since 1930. Since the 1990s, thousands of exoplanets have been detected around other stars. Pluto is not even the furthest known world here in our own solar system. Plutinos and Cubewanos may sound like exotic subatomic particles or Star Wars characters, but they are populations within the myriad of ice-and-rock bodies that make up something called the Kuiper Belt. It lies beyond the classical planets — and New Horizons is there. Yet more objects lie beyond it, all the way out to the Oort Cloud, a ghostly globe dissolving into interstellar space, and made of primordial lumps of ice and dust that never fell towards the disk from which the rest of the solar system formed. They lurk, dead and dark, until very occasionally, one falls in towards the Sun to become a comet flaring off gas and dust. Finally, in the Sun's extended family, there may even be a giant planet out there, wandering loose and unimaginably distant, which was lost long ago . . .
Neptune's orbit is like the edge of a 3.6m-diameter round table, able to seat 12 comfortably . . . It's difficult to imagine how big the solar system is, but suppose the Earth's orbit was the edge of a CD or DVD. The Sun is 150 million kilometres away, or one astronomical unit (AU): that's just 6cm in the CD analogy. Jupiter, the biggest gas giant planet, orbits at 5AU, or 30cm. Neptune, the furthest at 30AU, would be 180 cm out. Its orbit is like the edge of a 3.6m-diameter round table, able to seat 12 comfortably, but demanding a stretch to reach, say, a jug of water, if it was within Saturn's orbit. The span of the classical Solar System is this table. Beyond the table is the 'emptiness' that New Horizons is heading into. The table's rim meets the inner edge of the Kuiper Belt, a diffuse haze of objects (KBOs: Kuiper Belt Objects) that stretches to 50 or 60AU, like a great ring two metres wide floating around it. What about Pluto? It's not like the other planets. Its largest moon, Charon, discovered in 1978, is so big that together they are like a binary planet, orbiting around the common centre of gravity between them. But even in 1930, Pluto was a misfit. Its orbit is not nearly circular but wildly eccentric, swinging out as far as 49AU. As New Horizons flies by, it's just 33AU out, or about a knife's length from the edge of the table. Artist's impression of New Horizons passing Pluto, with Charon and Sun beyond, courtesy NASA. The animation (shown above), by astronomer Axel Parker of the Southwest Research Institute, Colorado, demonstrates not just their paths, but the spread of the whole Kuiper Belt. Pluto is close enough for sunshine to warm gases up from the surface, so we can expect weather on Pluto. It recently spent a 20 year stretch of its 248-year orbit even closer to the Sun than Neptune, just skimming inside our solar system table edge. For every three orbits of Neptune, Pluto orbits the Sun twice, which defines it and others into a KBO sub-class called 'Plutinos'. And Pluto is tiny. At just 2,370km across, it is smaller than the Moon. Earth is 455 times heavier. In 2006 Pluto was downgraded by the International Astronomical Union (IAU) to a B-list club of 'dwarf planets'. They are too big to be randomly-shaped so have settled into spheres (or more precisely, spheroids), but cannot clear their orbits of other nearby bodies. Is Pluto a planet or a dwarf planet? A War of the Words now smoulders across the Kuiper Belt. California Institute of Technology professor Mike Brown claims credit for distinguishing Pluto and large KBOs, several discovered by himself, from the classical planets. He's even written a book called How I Killed Pluto and Why It Had It Coming. Brown was interviewed by Space.com in 2010 and said "the people who jump up and down the most about Pluto being a planet have the most to gain from Pluto being a planet. They're on the New Horizons mission . . .", and that would include Alan Stern, New Horizon's Principal Investigator. In 2011, Stern told Space.com that by coining the dwarf planet category, "the IAU really embarrassed themselves"; he compares the orbit clearance rule for planets by saying "we're going to call it a cow, except when it's in a herd". NASA itself hedges its bets, referring to Pluto as a hitherto 'unexplored planet' then a 'dwarf planet', but also as an 'ice dwarf'. Aliens may lurk there, but a tell-tale infra-red signature indicating their activity is unconfirmed. Other KBOs already IAU-designated as 'dwarf planets' are Haumea, Makemake and Quaoar. Each of these are over 1000 km across, about half the diameter of Pluto, and have orbits that average around 45AU out — where the Kuiper Belt is densest. Mainstream KBOs such as these are Cubewanos. Ices stay frozen on them so, unlike Pluto, weather is unlikely. But there is one dwarf planet a whole quarter heavier than Pluto, and Brown discovered it in 2005. 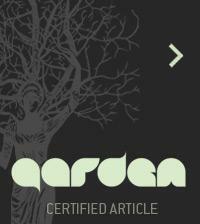 It was initially hailed as the tenth planet. Eris is a 'scattered disk' world, meaning it swings out beyond the Kuiper Belt — as far as 98AU, or almost 6 metres in the CD/table analogy. It needs the room around the table to orbit in. There are no plans to send any probe to a dwarf planet after Pluto, and they will remain unsurveyed for at least decades, maybe forever. However, in 2019, New Horizons will examine a smaller KBO — probably one about 40km across called PT1 (Potential Target 1) or 2014MU69. And then there is Sedna, another 'world' co-discovered by Brown. This too is about 1000km across, but steers well clear of the Kuiper Belt. Right now, it is silently storming into the solar system, only 60 years away from its closest approach, which will be a mere 76AU from the Sun. That's nearby, when you consider that its orbit takes over 11,000 years, and goes out to perhaps 936AU- over 55m from our classical solar system table, or a whole block away! So far, Sedna is the largest of a class of objects called Sednoids. 'Alone in Space' . 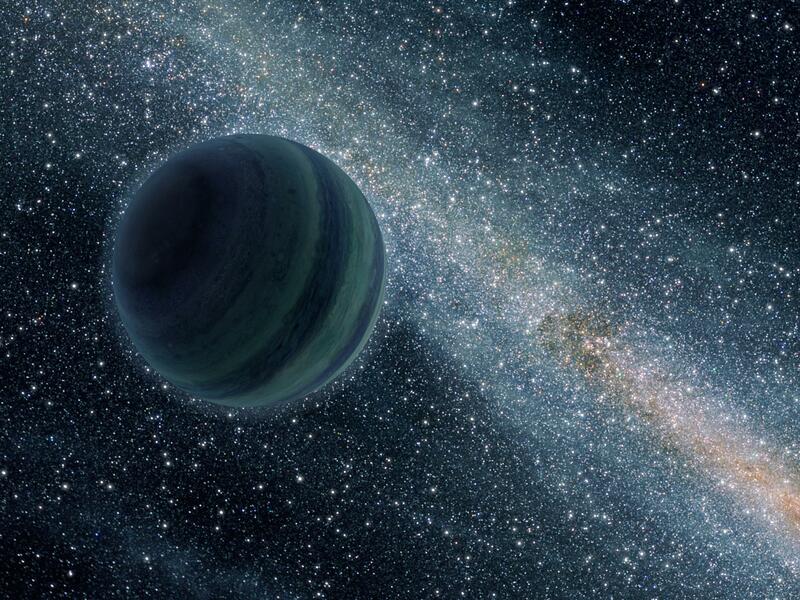 . . a rogue planet, visualised by NASA. Never mind the Sednoids, could there be life out there in the outer solar system? With temperatures ranging from just -218C on a warm Pluto day to as low as -262C on Sedna, the answer is no. It was once suggested that aliens may lurk in the Kuiper Belt, but a tell-tale infra-red signature indicating their activity is unconfirmed. Of course, they could always be in a state of deep freeze. On the other hand, astrobiologist Chandra Wickramasinghe has long advocated the panspermia hypothesis, that life's origin is in space; that life may even fill the universe and that comets could have brought it to Earth. Right now, the European Space Agency's Rosetta is over Comet 67P/Churyumov-Gerasimenko as it swings through the inner solar system, with its tiny Philae lander awkwardly nestled on the comet itself. Wickramasinghe recently suggested that the comet's black surface is a sign that it is teeming with 'micro-organisms'. That has been widely dismissed, but if the panspermia hypothesis is correct, the solar system's furthest element, the Oort Cloud, is a huge storehouse of dormant life — or at least its building blocks. 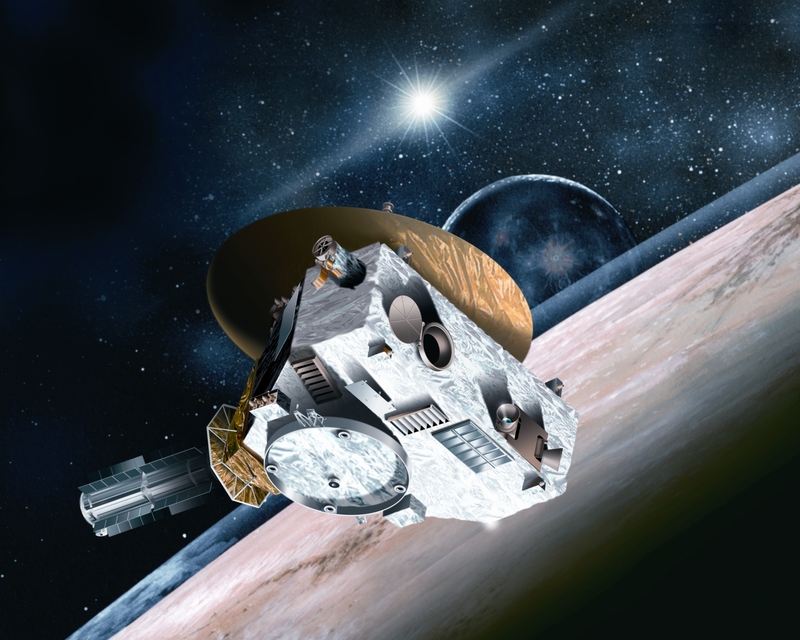 New Horizons and other space probes have a long way to go before they reach such distances. The furthest space probe, Voyager 1, was 132AU from the Sun this July, a mere eight metres from our classical solar system table. The Oort Cloud's main shell may start at a few thousand AU out — a couple of hundred metres from the table — and stretch 100,000 AU or two light-years. That's half way to the next nearest star, or six kilometres from the table. Where is this planet to whom we owe our very existence? But the Sun's family may not finish there. David Nesvorny of the Southwest Research Institute has run simulations of different configurations of gas giant orbits, from more than four billion years ago, to see how they would need to have originated to result in today's solar system. In 2011, he published the result — the best fit would be if a fifth gas giant was ejected, causing Jupiter and everything else, including the Kuiper Belt, to jump out from previously-closer orbits. That gas giant would become a 'rogue planet' wandering interstellar space alone, like a sacrificial child of the Sun that had to leave home so that the others could settle. Where is this planet to whom we owe our very existence? Nesvorny reckons it may be moving away at about a kilometre per second. By now, it could have travelled 10,000 light years, a tenth of the way across our galaxy, the Milky Way, and over 30,000 kilometres from our solar system round table! The Kuiper Belt is crowded compared to the interstellar void. From objects known in 2013, Brown estimates that as many as 543 dwarf planets, as small as 200km across, are 'probable'. On our round table, the Sun is the size of a grain of sand and Jupiter less than a hair's breadth. But these dwarf planets around it would be the size of a virus. 500 such-sized particles (a tenth of a micron across) in a fair-sized dining hall (500 cubic metres) would make its air several million times purer than normal. Even the highest air purity standard for scientific/industrial cleanroom facilities, ISO 1, is a tenth as clean. It's not a perfect analogy, but it tells us something about the Kuiper Belt. Even with all the strange unknown objects around it, New Horizons is, after all, at the edge of emptiness. And, ultimately, if it was be the last space probe to encounter a never-seen-before world, perhaps our exploring spirit is also to be found at an edge of emptiness. 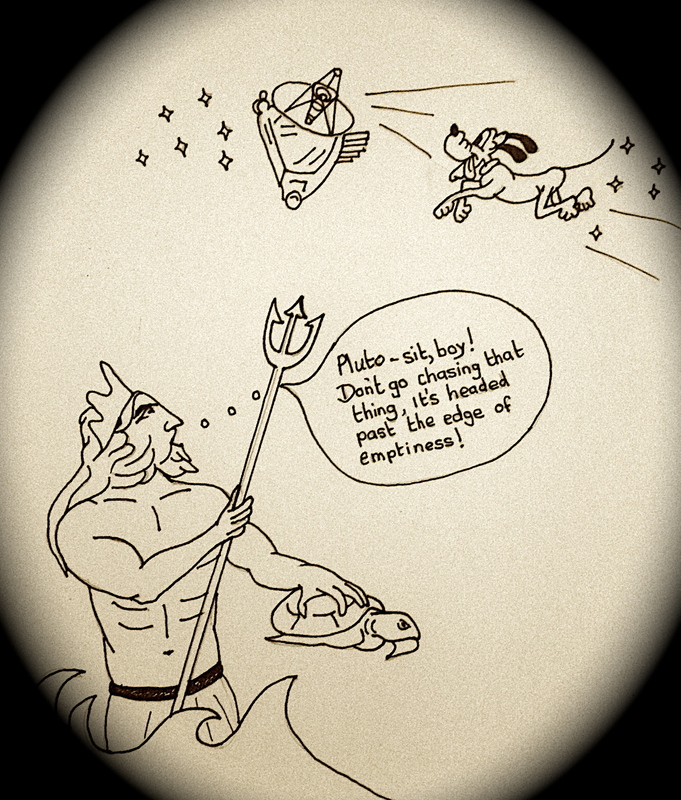 Neptune tells Pluto to curb his enthusiasm. Cartoon by Jane Noël. Resolution, 2014: Two ears, One mouth . . .